PROTECT your R nineT with the 15% off Product Bundle. 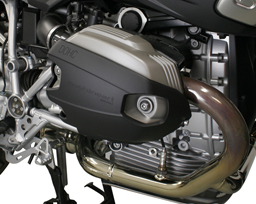 •The X-Head DOHC cylinder guard and MudSling™ rear suspension guard protect the damage vulnerable areas of your R nineT while being beautifully integrated with each of the 4 R nineT models' styling. X-Head DOHC is designed to protect more cylinder head surface area than any other guard in the event of a fall. Even if it gets away from you in the driveway, the inertia will cause the bike to roll onto the face of the cover before the bike settles down on the bottom of the cylinder. 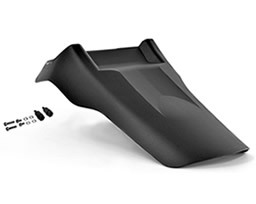 Behind the super tough nylon shell is a thick rubber liner that helps absorb impact force against the cylinder. Styling is distinctive while letting just enough of the cylinder head shape to show through. •The MudSling™ R nineT rear suspension guard is designed to look slender and integrated with the minimal styling of the R nineT. It fits all four R nineT models to protect these bikes' wide open rear suspension area from stone chip damage and mud accumulation. Effective coverage area is 8" wide x 12.5" long to protect the shock while reducing splash out to the sides onto riders' legs. MudSling™ is precision injection molded in resilient polypropylene with a fine texture matching other plastic part surfaces on the R nineT. MudSling™ fits with the BMW shock, Ohlins BM440 and BM650, and other premium suspension. Installation to the Pure, Scrambler, Urban GS, and Racer models is simple using four screws to existing points on the frame. Installation to the original R nineT requires an extra step as it is the only model that comes with a shock pre-load adjuster mounted to the OEM shock. Before placing your order, please read important installation information via this link.